There are times wherein students accumulate a large number of absences, so much so to the point where it could eventually lead to his or her academic failure. Naturally, educational institutions which house such students will want to come up with a means that prevents them from taking so many absences.You can also check learning contract templates. In that case, it would be wise to come up with a document that allows the student to understand that repeated absences are not acceptable. 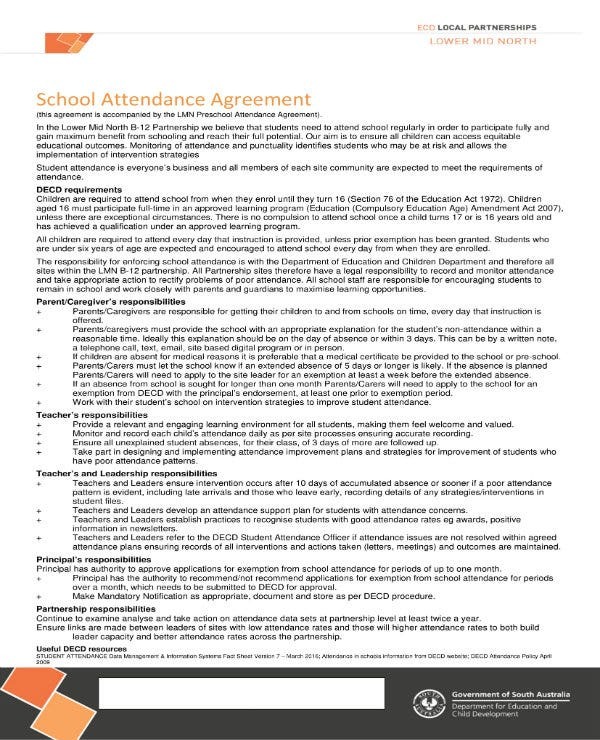 And that’s why this article is going to teach you all that you need to know in regards to creating a student attendance contract. You may also like behavior contract templates. Remember that the purpose of setting up this type of student contact is to ensure that the student is always present within the educational institution when required. 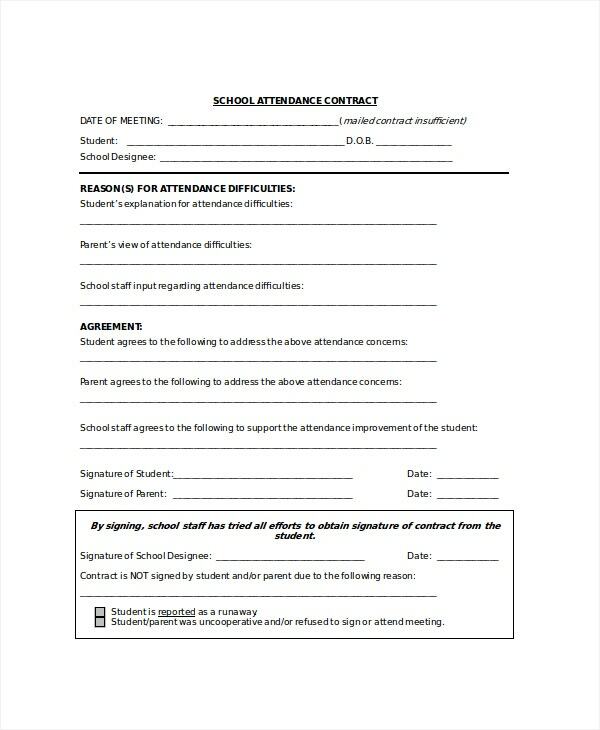 The document should be able to outline everything from when the student should be at school to what should happen in the event that the absences continue to pile. This will help the student understand what is expected out of him or her. So long as the contract provides all of the necessary information, then one shouldn’t have to worry about the student realizing the terms and conditions that needs to be followed. 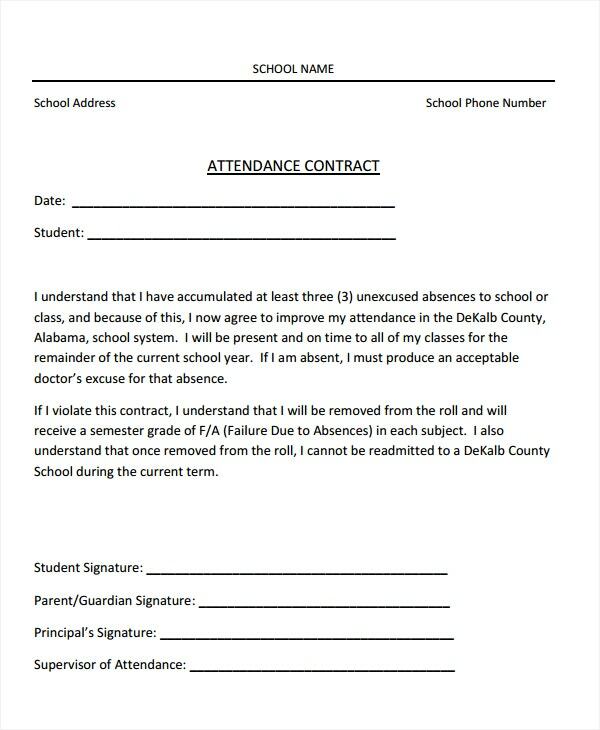 You can also see teacher contract templates. The first step is for you to write down all of those that will be involved in the contract. 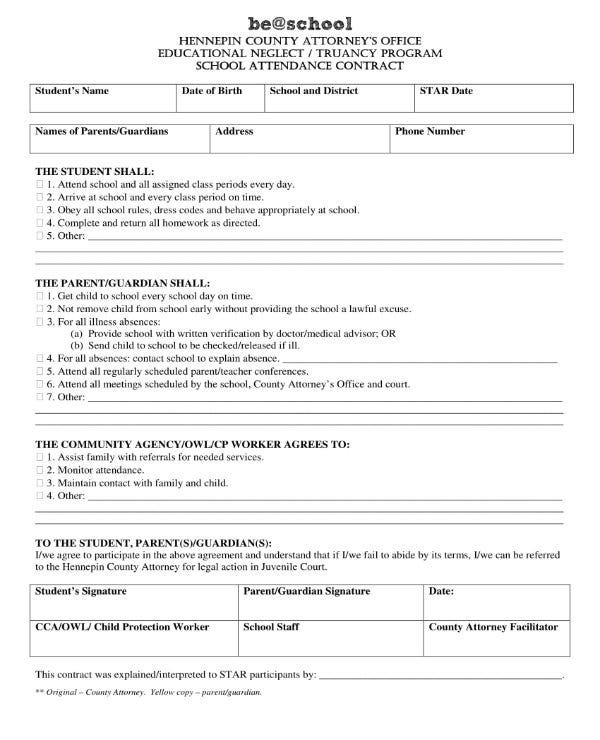 This is where you will need to point out the name of the student that the contract is going to be focusing on, as well as the educational institution or its representative that’s in charge of handling the student’s absences. 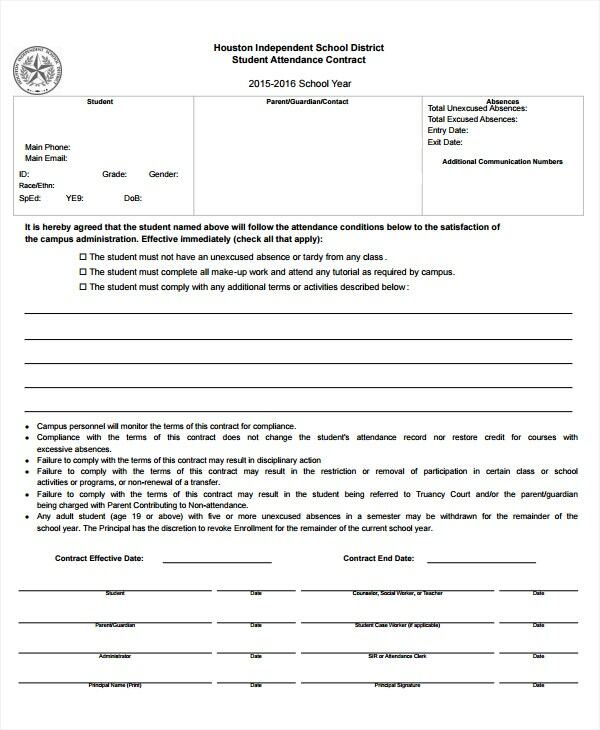 It’s very important that you include this information as there might be situations wherein you might have to prove the identity of the student who has accumulated a number of absences. You can also like safety contract templates. So what you will have to do is to write down the complete name of the student into the contract. Make sure that you include the first name, last name, and the middle initial to easily identify the student. Do the same when writing down the name of the educational institution or its representative to show who is responsible for the creation of the contract and the agreement templates. Once you have managed to identify those that will be involved, then the next step is for you to write down their basic information. This will without a doubt come in handy as there will be situations wherein it’s needed. 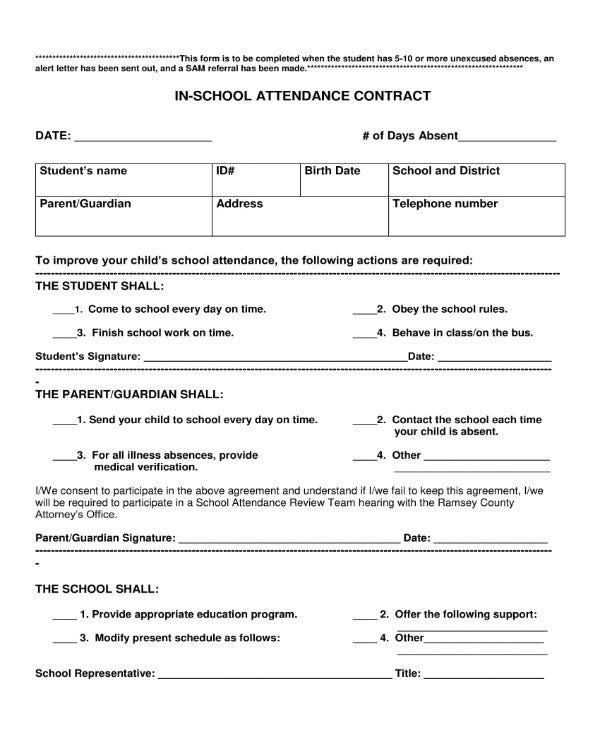 For example, if the student’s instructor must contact the absent student at any given point in time, then all that needs to be done is to take a look at this section of the contract. Be sure to include the following. You can also see artist contract templates. Addresses – There might come a time wherein the institution might be required to send documents that contain anything that has to do with the student’s absences. In that case, they’ll need to know the communication address of said student should they not be able to make a personal delivery. So all you have to do is to make sure that the the student’s complete communication address is provided in the contract. Be sure that it’s complete by seeing if it has everything from the name of the street, all the way to the block number or event the room number. You may also like project contract templates. Contact Details – In the event that either the student or the institution needs to get a hold of the other at any given point in time, then having each other’s contact information is one of the best ways that will ensure that they always have a means of communication. So what you will need to do here is to write down the contact details of both parties. It’s best that you include as many as possible as that can help ensure that one is able to contact the other. Try to include information such as either party’s phone numbers, email addresses and more. 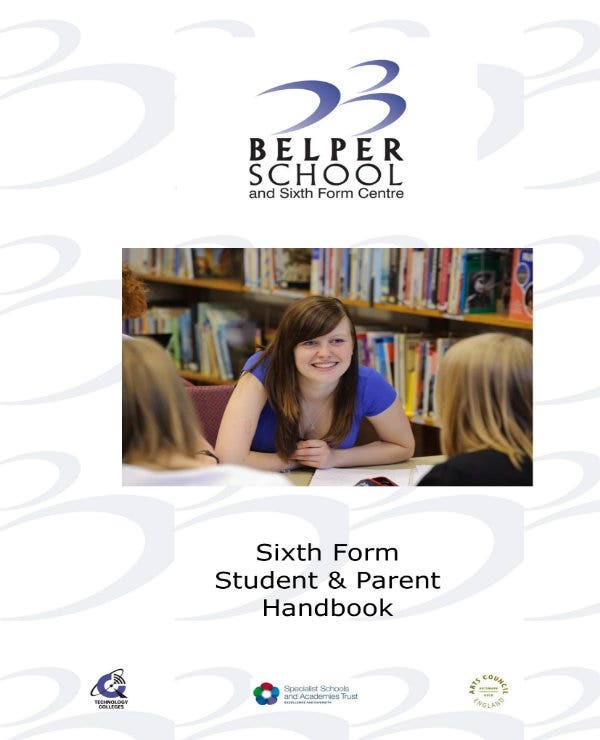 The Student’s School Information – Although the name alone can help identify the student, knowing about the student’s other information can easily help in the identification process. So what you will need to do is to include the information such as the student’s year level and the class section that he or she is in. You may also see development contract templates. A student who is made to sign this particular contract sample would want to know specifically why he or she would have to do so. This is where you are going to have to provide a section that tells the student exactly why he or she is in this predicament. Basically, you’re just going to have to answer this one question: What warrants the creation of the absence contract? When you think about it, there are many possibilities. It could be that the student has decided to stop attending multiple classes or maybe the student has not attended a particular class for the majority of the semester. When you’ve managed to obtain all of the information that allows you to point out why, then all you have to do is to write it down in the contract. 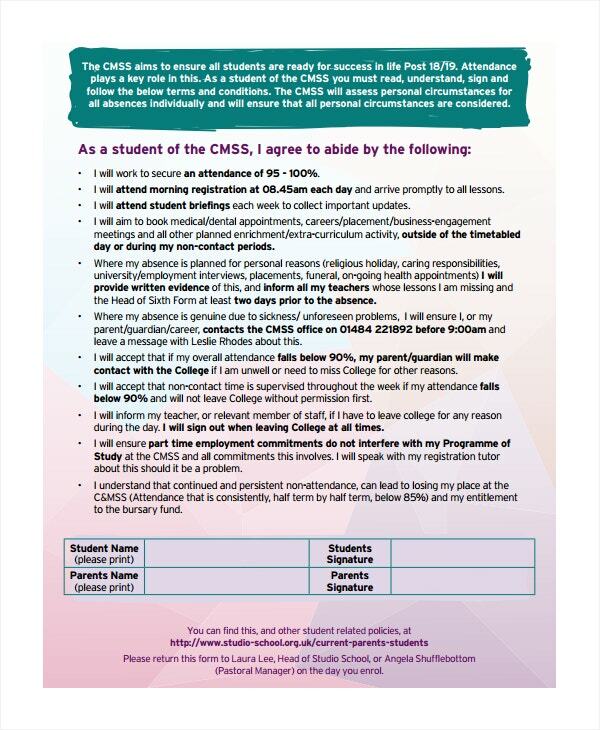 Again, it cannot be stressed enough as to how important it is that you make the reason as clear as possible when explaining to the student via the contract.You can also see student learning contract templates. Now comes the section wherein you must point out exactly what it is that the student must do in order to reduce absences, as well as to make up for whatever was lost because of these absences. It’s important to be as clear as possible when doing this as you want the student to know exactly what needs to be done. You can also like producer contract templates. 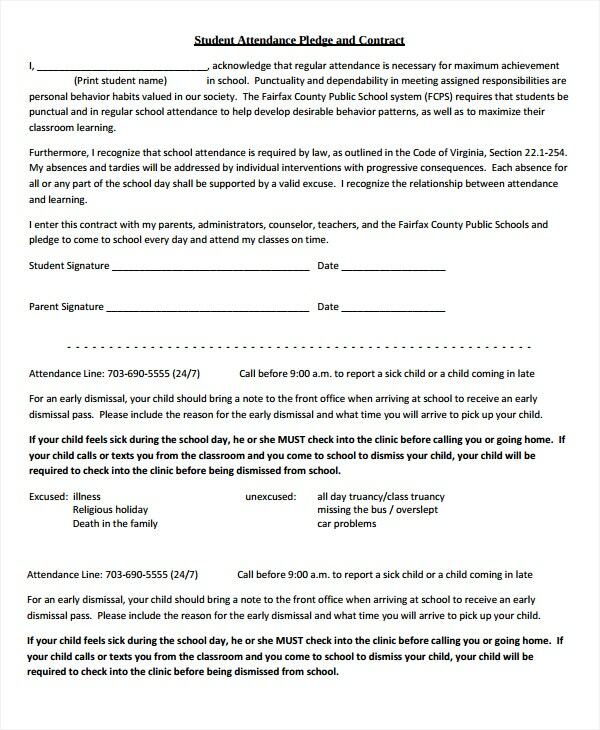 To start, you have to think about the best methods that can prevent the student from continually incurring absences. Although there are many methods that will allow you to do so, you have to think about the ones that are most effective. Once you’ve come up with the most effective methods, list them down into the contract. You may also see employment contract templates. Then you have to consider what the student has to do to make up for the number of absences he or she has already incurred. Again, there are many ways to do this. You can state that the student will be require to take up remedial classes, or you can state the student has to participate in extra-curricular activities. Again, this all depends on what you think is going to be the most effective method that will help the student in terms of avoiding and refraining from absences. You may also notice cleaning contract templates. A contract template is one that contains many terms and conditions that need to be met. So if a student were to fail in meeting with the expectations that have been set in the contact, then he or she can expect to carry the consequences. You need to specifically point out what these consequences are so that the student will do what’s needed in order to avoid them. When thinking of the consequences, it would usually resort to the student being suspended or even expelled from the institution. However, there are those that are more lenient. A good example being that the student will receive a reduction on his or her grades or that the student will no longer be allowed to take part in any extra-curricular activities. The type of consequences that should be written down will all depend on the situation of the student. If the student is prone to making many absences, then it’s only natural that the consequences would be harsher than normal. Just make a decision that you think is fair. You may also like investment contract templates. Once all of the information has been written, then all you have to do now is to have the student sign the contract. Make sure that you create a space where the student is able to place his or her complete name as well as the signature. The point of doing this is to show that the student has agreed to everything that has been written in the contract. Also, include the date when the contract was signed to ensure that the readers know when the sample agreement was made and finalized. If you would like to learn about the other types of contracts that you can make, then all you have to do is to go through our site. It has many different artices, all of which should have the information that you’ll need. Just be sure that you are able to read the ones you’uve chosen thoroughly so that you can make the most out of what they have to offer. You can also like hr contract templates.